Okay, I didn’t see this coming: Boxee has rebranded its new consumer electronics device just five months after it first became available. The $100 device, which combines live TV and cloud DVR functionality with apps like Netflix, (s NFLX) is now being called Boxee Cloud DVR, after previously being marketed as Boxee TV. The company also used the rebrand to unveil a free service tier for its DVR. 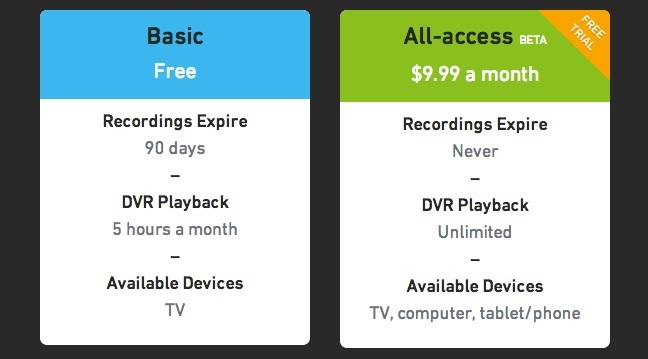 Boxee’s Cloud DVR now comes with a limited free service tier. The new Boxee Cloud DVR box offers users unlimited storage for their TV recordings in the cloud. Unlimited playback, as well as the capability to view recordings on computers and mobile devices, costs users $10 a month. The new free service tier offers up ro five hours of DVR playback every month. There is still a free test period while the service is in beta. So why did Boxee take the unusual step to rebrand a product just months after launch? The company’s VP of communications Andrew Kippen told me Tuesday that the previous name didn’t accurately capture the device’s functionality, letting consumers to believe that it was primarily a media player similar to Apple (S AAPL) TV or Roku. The new name is meant to emphasize the DVR functionality as a key differentiator. However, It’s worth noting that the company’s DVR service is currently just available in eight markets. Kippen told me that the plan is to extend the service to 26 markets by the end of the year, which should cover most of the country. As part of the rebrand, Boxee seems to also have toned down its cord cutting rhetoric. The company made its ability to replace cable a key selling point when it unveiled its new device last fall, even promising “Free TV” prominently on the Boxee TV packaging. On its newly-launched website, Boxee instead compares the device to TiVos and cable DVRs, touting unlimited storage and not free broadcast content as the key differentiator. That has likely to do with the fact that Boxee wants to get access to cable content as well. The company struck an agreement with Comcast (s CMCSK) to access encrypted basic cable signals last year. That’s a decidedly different path than the one taken by Aereo, which has been battling Comcast’s NBC and other boradcasters in court for its take on cloud TV. Check out our paidContent Live conference in New York next week for a fireside chat with Aereo CEO Chet Kanojia. They have licenses hence why its only available in certain areas. They do in fact record a copy for every single user who records. They are not allowed to just say have a master copy and if you happen to record that show enable it for you. Instead it has to upload the full thing for every user. As longs at they are recording a single copy for all users and storing that and playing it back they do not need a license. There was an important legal case on network based DVR called Cartoon Nework v Cablevision. Other businesses operate in this manner like DAR.fm the DVR for radio. It does require lots of bandwidth though and many cable connections and some DSL have very slow upload which could be an impediment to usage. Services like Aereo and DAR.fm record directly to the cloud and don’t use the end user’s bandwidth so they avoid the upload speed limitation. This company has to look at themselves in the mirror and figure out how to stop f’ing over consumers. Lies and broken promises are not going to get you very far. Good Luck. The box like the boxee box is at best running beta firmware and with boxee history its likely to never get beyond that point. Reviews of it point out the fact its got issues all over the place the coaxial hookup gets hot enough to burn. This would also be the same Andrew Kippen who promised a final boxee box update to fix the flash problem. Rather amazing bit of magic hot air that since adobe doesn’t make flash for the devices anyone. They sell crap and are as honest as a bunch politicians and used car salesmen. From some of the older reviews it does seem to record then push it out to the cloud. There is no Master recording or else they would get sued. It has to be one recording per customer. So I took a closer look at their site…I couldn’t believe it when I wasn’t allowed to order one because I don’t live in one of the 8 authorized areas. This screams of them recording the local OTA broadcasts, setting up some sort of master show recording, then feeding it out to all the subscribers who opted to record a particular show in that DMA. Has anyone actually validated that this thing records what is coming through the antenna and pushes it out to the cloud? If I’m right, then it is CLEARLY different than Aereo’s service model and is a clear violation of copyright. According to reviews, it does in fact upload to the cloud and replay from that same recording. Because of this fact, the quality stinks and is a legendary bandwidth hog. What a second…the DVR functionality is only available in 8 markets? Does this box not just push your recorded content out to the cloud? They’re taking the same approach as Roku. At first they touted the many people that were cutting the cord because of them. They have since backed up from that approach and are partnering with the likes of Time Warner. Still who cares about a name change when the device doesn’t ever work like it’s supposed to. The most basic function of a DVR. Pausing live tv doesn’t even work. . .